The ibis Styles Metz Centre Gare is ideally located in the Imperial District. 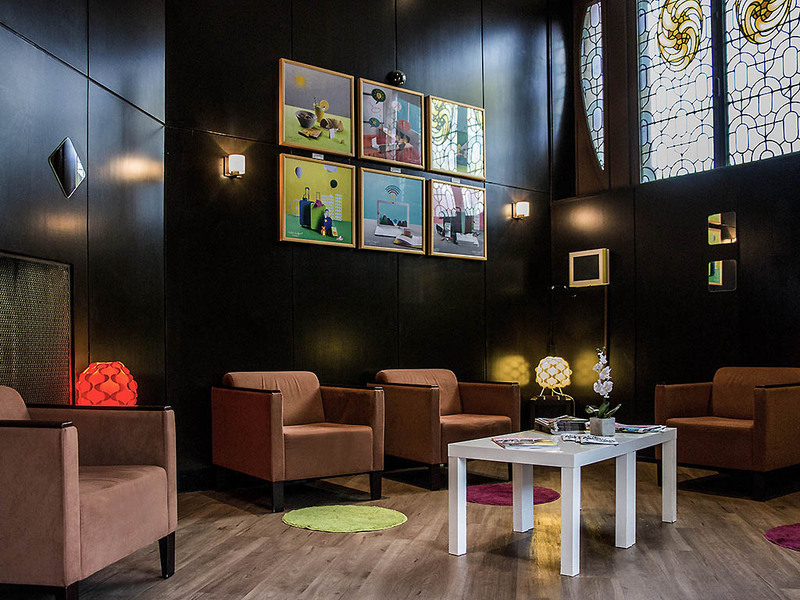 Only 109 yards from the train station, a 5-minute walk from Pompidou Center and 10-minute walk from the historic center and its cathedral. Outdoor public paying car park. One night stay for family visite. Good location but annoying construction in front of the hotel. Breakfast is ok but still room to improve. impressive facilities at a throw-stone away from the main station and the motorway, but in the middle of the &quot;Wilhelm II quarter&quot;. Breakfast is a bit below expectations despite the very welcome freshly squeezed orange juice. But I really want to thank the staff who really went out of their way to help search & recover a personal item lost in the laundry. the Hotel is in a great Position in a beautiful old building. Some Details have to be taken in consideration . Please repair the broken window on the way to the room. The tub window needs to be fixed, the water floads. The room is ok , quiet .The bathroom Need to be renew. The breakfast was ok , full of uality products.Please offer better ham . Easy walk when coming by train. Nice reception. Dated- key system is old and they olbmt have one. It was not clearly explained to us the first day that if we didn’t leave the key with the reception they couldn’t get in the room. We had not cleaning service the first day as a result. Then it took 3 hours to get fresh towels. Comfortable and spacious rooms. Reception staff were very helpful and friendly. Great breakfast. Nicely laid out spaces e.g. lounge etc. Kind staff, clean rooms and good composition of communal space. Good hotel, conveniently located near station but quiet area. Friendly reception staff who quickly located towels for us which had not been left in the room, sizeable rooms and clean. Very good location for arrival in Metz and exploring the area, located between modern Pompidou Centre and historic old town. Easy going and smooth process. Love it. Easy access hotel, Clean rooms, good breakfast and helpful staff especially Ms Lucy! Really enjoyed my stay and will recomend anyone to go Ibis styles metz in a heartbeat. And thank you for your hospitality! Please take care and be happy. Very cosy, quiet and god location. But the wifi was NOT good, we could get it only in the first part of the room, close to the door. No wifi by the bed. And we were disconnected very often. Another problem is the plug in the bathroom that was too far from the mirror and &quot;le lavabo&quot;. Nice hotel, good location, nice, well equipped and very clean rooms, but difficult to have working telephone in the room. The front desk lady has been really more than helpful to find another room for me with a working phone, but it was tough. Apart this, it' s a very good place to stay. Staff friendly , rooms functional and air conditioning perfect. Breakfast had everything we needed. Hotel well situated and served our needs well. Some minor irritants, but a pleasant place to stay at a reasonable price. Staff were very helpful & friendly. Room was spacious, though the space for the toilet is very narrow. A small fridge would have been nice, so that we could have cold drinks. We were in town for a few days of business meetings. Our stay was great in every way, from the comfortable room to the delicious breakfast. Close and convenient to the train station, beautiful cathedral area and lots of good restaurant choices. Would stay here again in a heartbeat. Reception unhelpful, room smokey, no convenient parking, staff gave contradictory information about booking and refused to back down when challenged. Nice breakfast but coffee machine stopped working. Metz is full of hotels. This one is not trying hard enough. Would not return. We stayed with my wife in the hotel for 1.5 weeks. Excellent hotel and helpful reception. The room is quite big and really perfect WiFi (works better then at my home:) ). Breakfast was nice as well. Thanks for opportunity to make orange juice. Also very good location, close to the center. We enjoyed the bad very much! We stayed in the hotel for 2 nights. Like: Very polite personal which is willing to help you. Room size was very good and enjoyed the quality of bed. Liked very much the breakfast - opportunity to make a fresh juice is nice. Surprisingly the Wi-Fi internet was very fast, which is not typical from my experience. The fastest internet I have ever seen in the accor hotels. To improve: We didn't really like that there is a construction on the road in the building next to the hotel . In the morning and day there was a lot of noise and construction dust. The door to the toilet in the bathroom was not closing. Air condition system was squeaking. The water tap in the bath was quite old, was very difficult to setup the temperature, always was too hot or too cold, valve was too hard to move. Cutlery in the breakfast were very dirty! In overall, very satisfied with the hotel and gives positive impression. So we decided to book it again for one more week instead of Mercure in Saabrucken Germany.